Learn more about Josh Simpson's extraordinary unique deep amethyst glass mixture. "As an artist I have toured and photographed nuclear power plants. One of the most profoundly fascinating things I witnessed was Cherenkov radiation, which appears as an incredibly pure blue light emitted from uranium fuel rods glowing below 40 feet of crystal clear water within the core of a nuclear reactor. This radioactive light is as beautiful to me as a candle flame must be to a moth. I resolved somehow to re-create that intense blue color in my glass. New Mexico glass is as close as I can get to the color of Cherenkov radiation; it also reminds me of the sky on a perfect summer night. I had never been to New Mexico when I created this glass, but that was how I imagined the color. Sometimes the patterning looks like the ocean during a storm, with swirling waters and crashing waves. At other times, I can make it look like a Hubble Space Telescope photo taken of another galaxy. I make New Mexico glass by melting metallic silver onto the molten surface of a dark glass. As I form each piece, I carefully control the temperature and flow of oxygen and propane into the glass furnace, thereby enhancing and enriching the color. If you hold one of these pieces up to a bright light, instead of the peacock blue color you will see that it transmits red or dark purple - a distinctive property of dichroic glass." These images are of Josh's glass currently in private collections... not available for purchase. Learn more about the one of a kind, colorful and fully detailed glass worlds handmade by Josh Simpson. 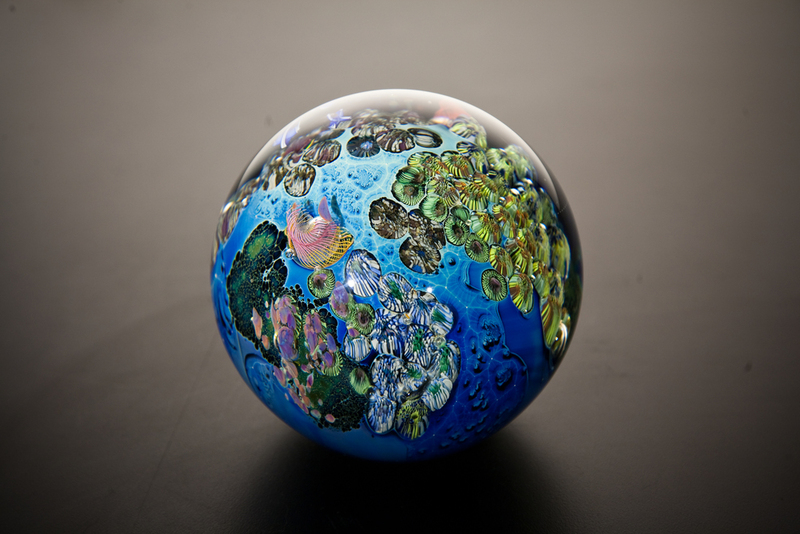 Inspired by the story of Apollo astronauts seeing the earth ‘hanging like a blue marble in space,’ Josh Simpson began creating his own fanciful marble-sized planets in the mid-1970s. This early artistic exploration, combined with his intense interest in physics, cosmology, astronomical phenomena, and all things mechanical, inform and inspire his work to this day. 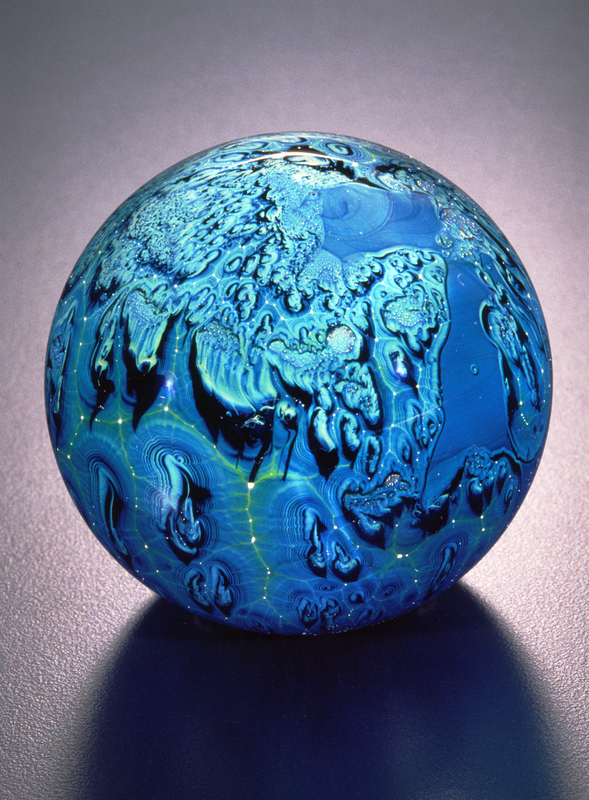 A ‘planet’ begins when silver metal is melted onto a small glob of a unique formula of molten glass, followed by the addition of multiple layers of colored glass, and sometimes gold or platinum leaf. Each planet has spectacular sea or landscapes. On some you can observe or imagine active volcanoes, enormous structures perhaps built by alien species or stunning ocean storms and weather patterns. Build your own collection? Josh makes a variety of different sized Planets. "In effect, the Planets act much like Persian miniatures, whose small format and richly painted micro-environments were designed to encourage contemplation in an intimate, relaxed manner. The beauty of these objects simultaneously calms and excites the eye, providing a momentary flight from the mundane that refreshes the mind." These images are of Josh's glass and currently in private collections... not available for purchase. Various sizes: 1 7/8" - 2 1/4"
All resting on clear acrylic dimple stands. 4.25" Megaplanet on Josh's desk. Learn more about Josh Simpson's wondrously unique copper ruby glass mixture. A glass blend that is used only once a year to make Planets, vases and occasionally bowls or platters. The glass is made by adding copper ruby to the usual glass mixture of silica, soda ash and lime. Reactive silver is then added to the surface to make the striking pattern similar to Josh's Blue New Mexico glass. 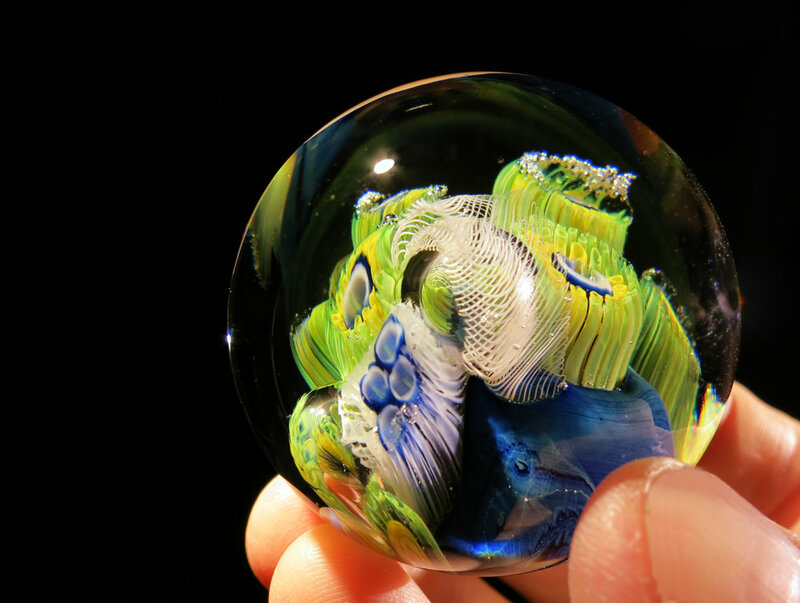 Learn more about Josh Simpson's beautifully complex nebula inspired glass mixture. 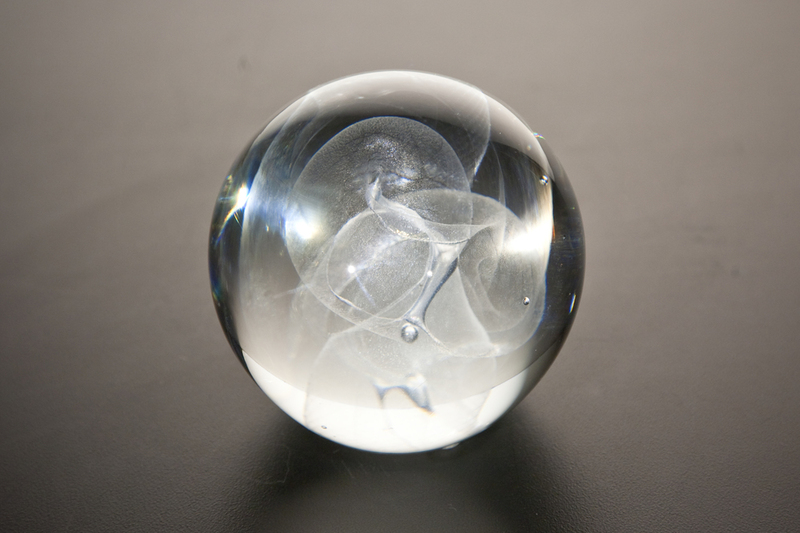 Corona Glass is the most fascinating and unpredictable material I have ever worked with. I’ve been trying to understand this glass for more than thirty years, but I still don’t know for sure how any given piece will turn out. When everything goes well, the final appearance can be just gorgeous, like a splash of liquid fire, an eddy of swirling melted light or an exploding galaxy. When things go badly, the result can be downright awful. Some people speculate that I was inspired to invent this glass after seeing photos of nebulae, planets, stars and distant galaxies taken by the Hubble Space Telescope. However, while my Corona Glass does sometimes resemble those spectacular images, the truth about its creation is a bit more complex. It is (like my own life) a story of blind luck, stupid persistence, partially managed chaos, incremental discovery and intermittent, occasionally astonishing, success. It all started with an amazing accident. Back in the 1970s, as I began to learn about glass, I constructed a pot furnace that allowed me to melt small batches of various colored glass formulas. At the time, I would casually throw in a teaspoon of this, a pinch of that and a dash of something else. After I had let the whole thing melt at a very high but random temperature, I would then make the resulting mixture into a platter or bowl or whatever, to see how it turned out. Basically, I was playing at glass chemistry. Most of the time, the result was interesting and I learned something from it, but only now and then was the artwork beautiful. Unfortunately, and typical of my offhand attitude at the time, I hadn't written down a speck of the formula! So I couldn't make it again - ever. In the following months and years, I paid a terrible price for my unscientific approach: I tried to make that miraculous glass again and again for nearly a decade, but the results never came close to being good enough. It had worked once – why couldn't I make it again? The search just haunted me, and I vowed that one way or the other, someday, no matter what, I was going to figure this out. Then in 1982 I was awarded a small grant from the Massachusetts Council on the Arts and Humanities. Because I’d been experimenting with silver at the time of my mysterious melt, I took all the grant money and bought several pounds of pure silver metal, which I self assuredly converted (don’t ask! This involves boiling nitric acid and billowing clouds of fumes) into silver nitrate. And then, every single week for an entire year, I melted that silver nitrate into different glass formulas. I also started keeping track of the minutia of each new melt, trying to be as scientific as possible. One year went by, and I hadn’t figured it out. Then another year, and another. The results were variously striking, intriguing, boring, and sometimes dull as mud. And then I used up all the silver. It was so frustrating! I had to make a living. I had to focus on creating the work that galleries were selling. I didn’t have the money to buy more silver, nor the time to continue melting experimental glass every week. Still haunted, I decided to make just one silver melt a year. And so I did, all through the 1980’s, ‘90’s, and early 2000’s, with varying levels of incremental success and understanding – but still no joy. Then blind random luck! The investment firm Lehman Brothers filed for bankruptcy, and along with collateralize debt obligations came the recession of 2008. Demand for my art vanished overnight and suddenly the time pressure to constantly make new artwork miraculously went away. At that point I could have chosen to stop working altogether, but I realized I was being handed an opportunity to return to my quest. I have now made glass from more than 400 separate experiments. I’ve learned more and more about what I need to do, and, through an uncharacteristically meticulous process, discovered that success depends on factors far beyond the simple ingredients and the temperature of the furnace. The result of this work is what I call Corona Glass. As a material, it remains quirky, unpredictable and endlessly fascinating to me, but at last I have finally started to make Corona platters, bowls and vases that are, increasingly reliably, truly beautiful. Because my own Corona Glass somewhat resembles a type of ancient Venetian glass called Calcedonia, I realized at some point that my early, accidental formula must have been close to the formula for that other ancient glass, which has been lost since the mid-1400's. Of course I went searching and eventually found an old text containing a likely recipe written in an obscure Venetian Italian dialect, but I didn’t know anyone who could decipher it. Maddening! Then one day – in another piece of “blind luck” that is so typical of my life – while hanging out with my wife Cady’s astronaut crewmates, Italian astronaut Paolo Nespoli mentioned a friend who studied ancient Italian dialects. Eureka! Could this be the key? We got in touch, and the answer was…well…hard to figure out. While the ancient formula does include silver nitrate, some parts of the formula are a little obscure: “Add 50 kilos of pebbles of Christ transparent,” or “The heat needs to be kept low otherwise the polenta will evaporate before the little pebbles start melting.” My favorite and most useful part of the 550 year old formula? Learn more about Josh Simpson's blown glass vases with layers filled with detail and beautiful vibrant colors. If you aren't familiar with my Inhabited Planets, you might not have any idea what "Inhabited" Vases are about. These vases are relatively recent explorations into combining Planet techniques with the functionality of a vase form. Looking closely at one of these puppies you may see spaceships circling in the outer layers of the piece. The spaceships, like the ones in my Planets, are made using ancient Venetian techniques. You might notice other themes from my Planets as well as ideas from New Mexico Glass and Iridescent work. With some I follow a fairly traditional vase shape but with a very thick layer of glass in the body combined with a delicate lip. I like the challenge of creating this contrast and the visual effect of the finished product. Learn more about Josh Simpson's traditional hand shaped and blown glass vases. With most of my work I have to spend a lot of time thinking about how to integrate complex design and a myriad of colors within a form. Iridescent Vases are great because I can play with pure form and color and not stress about the other stuff. The iridescence is caused by exposing the molten interior of the vase to a weak acid. The acid evaporates and is gone in a moment. The result is a rich and permanently etched surface that refracts and reflects the light surrounding it. Learn more about Josh Simpson's remarkable blown glass meteorite sculptures. "I began making Tektite glass (from the Greek tektos, meaning "molten") years ago, when a friend did a spectrographic analysis of a type of meteorite composed of glass, known scientifically as tektite. Tektite meteor glass is a combination of silica and a melange of metallic oxides that are abundant in the universe. It's profoundly different from the smooth, voluptuous crystal I usually work with. It's rough, dark, bubbly, and was never meant to be blown. By combining the right proportions of raw materials, I was able to re-create meteorite glass in my studio, and I started to make my own Tektites. Many glass factories talk about how they make "perfect crystal" - colorless sterile glass without bubbles, striations or other technical flaws. For me, Tektites are perfect crystal, they were made in heaven, eons before humans existed. Tektites and New Mexico glass are totally different, but to me, they're all part of the same continuum. When I make a platter, the New Mexico glass becomes a painting of the sky, while Tektite glass looks more like something that has hurtled into our world from above. Crystal glass is the ultimate malleable medium, Tektite glass has an uncooperative mind of its own. One minute it's liquid, a moment later it's stone. I can guide it but ultimately it becomes its own creation." "In developing the Tektites, Simpson returned to his earlier formulas for iridescent glass, finding a new purpose for techniques he had used for his Tiffany-style wares. The Tektites may be favorably compared with the Lava glassware made by Louis Comfort Tiffany, a series of small vessels with rough, dark, partially iridescent exteriors and interiors. Unlike Tiffany, however, whose inspiration was archaeological, Simpson's impulse was extraterrestrial." Learn more about these unique solid glass Meteorite Sculptures made by Josh Simpson. Portals came about because Tektite glass intrigued me so much. I have always been interested by the geology and surprise of geodes. Geodes are very ordinary looking rocks, but if you cut or break one open there is often a fantastic interior of colorful crystals that have formed over the eons. Portals that I make have a rough, dark, even gross exterior with a perfectly smooth window cut in the side. Portals to me are like looking inside a geode or maybe like being in a submarine or spaceship and having only one tiny window through which to look out on the hugeness of the ocean or galaxy around you. Learn more about Josh Simpson's intricate and uniquely complex Saturn sculptures. With my Saturn series I combine a Planet with contiguous, concentric rings of colorless, ruby, or New Mexico glass. This continuation of the Planet theme involves a rigorous procedure that requires the help of all of my assistants and hours of focused labor. Saturns provide a counterpoint to smooth round globes. Creating the rings in glass turned out to be way more difficult than I ever imagined, yet they convey the sense of whirling motion that I wanted. Saturns are not for sale online. Josh has a special group left in his collection.